Personnel - Jamie Saft: keyboards; Steve Swallow: electric bass; Bobby Previte: drums. What an amazing sound Jamie Saft exudes from the Baldwin electric harpsichord on “Re: Person I Knew”. 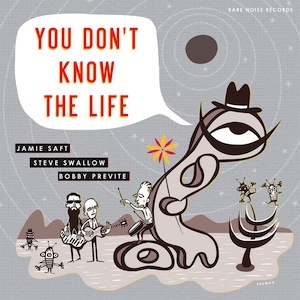 Rocking and grooving like if Sun Ra had joined forces with Deep Purple, this fresh take on the Bill Evans’ tune welcomes you to You Don’t Know Life, the third effort of the keyboardist with bassist Steve Swallow and drummer Bobby Previte. The organ-centered album is a tempting combination of improvisations, standards, and Saft originals. The three free improvisations almost don’t feel like such, considering that they naturally preserve backbone stability and follow a specific direction. “Dark Squares” is cooked patiently with nebulous synth chops at a medium-slow tempo. Sometimes noir, sometimes celestial, the tune has Saft choosing between long-held notes and staccato punctuation. “Breath From Water” flows steadily, suffused with Previte’s pervading drum timbres, which are even more authoritative on Roswell Rudd’s succinct “Ode To a Green Frisbee”. On the other hand, “The Break of the Flat Land” proves the less impetuous, more spacious of the three. The effective bass/drums pairing provides a reliable structure, whether if the tune is tender, like the brushed waltzing “You Don’t Know the Life” by the psych-rock band Moving Sidewalks, or unnerving, such as Saft’s “The Cloak”, where soul music tries to fraternize with prog-rock, and its swinging continuation “Stable Manifolds”, which, after entering in the groovy territory of Jimmy Smith and Dr. Lonnie Smith, ends with caustic chromatic movements. Closing out the album in a low-key style are two standards, “Moonlight in Vermont” and “Alfie”. This disc is a solid, accessible offering. It doesn't particularly feel like a shift in mindset, but rather a fun sculptural exploration of the organ trio format.